There is a list of things I would never have expected about wineries. At the top of that list: everything. 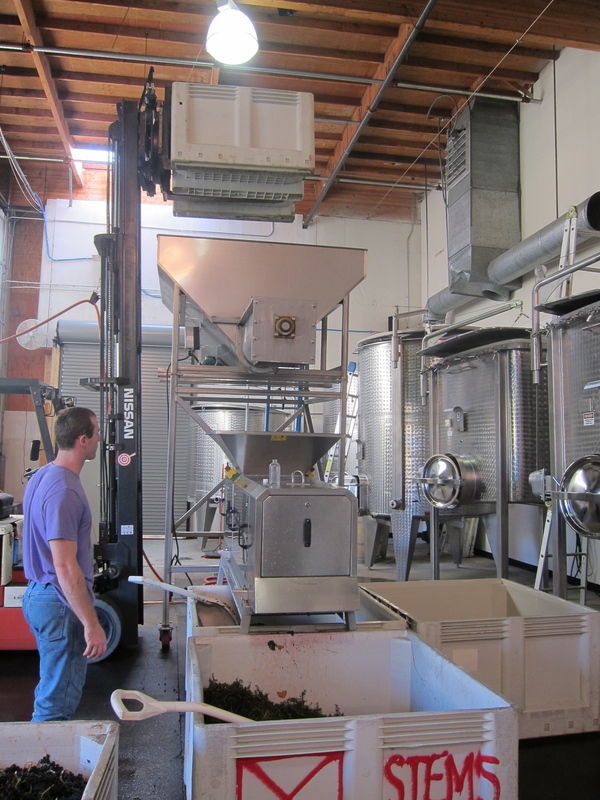 Within the top 5: at every facet, wine production feels like a life-sized game of Tetris. Consider a cellar. Any old space will do. Large, cavernous. Big tanks in a few areas. Machinery and pumps and sumps and hoses and nuts and bolts and clamps and valves and endless bits and bobs ranging in size from – to be specific – the tiny to the enormous. A few sources for water. A handful of electrical outlets. Drains all over the place. Engage harvest mode. There’s a crush pad – sorting table, hopper, crusher-destemmer. There are bins of fruit being forklifted around, getting dropped onto the crush pad, getting moved into tanks. Empty bins need cleaning and moving. Fruit needs sorting, monitoring, moving, sulphuring, dry-icing. There are punch downs and pumpovers with their tools, pumps, and hoses. There is pressing with its, well, press and its digging and its barrels and its own pumps and hoses. And all the cleaning and the moving. Nearly everything in the entire winery is currently in use and in your way. Your hands are wet. The cellar is loud. And let me be clear – this is NOT chaos. We fight valiantly against chaos. Everything is carefully structured to maximize convenience, efficiency, and access. Nonetheless, one of the biggest challenges can be figuring out how ON EARTH to get from one place to another. And it doesn’t stop there. This serves as an analogy for the winemaking enterprise writ large, from the multitude of routine activities in the cellar to the most complex matters of viticulture and blending. Consider a blending trial. Each blend contains, to name a few: different proportions of a given varietal, whole cluster fermentation, free-run wine, press wine, new and/or neutral oak barrels, wine fermented with different yeast strands, different clones of different grapes, grapes from different vineyards or blocks in a vineyard – I could go on. All winemakers subscribe to different approaches to drawing out variation in a wine. 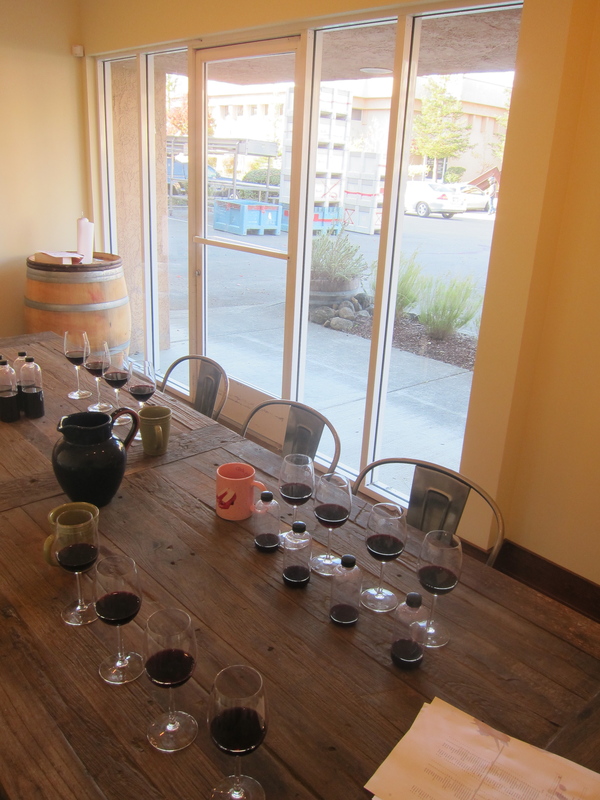 Every time we taste potential blends in a trial, we talk about them, compare them, score them, and rate them. We do this frequently for every wine still in production, watch the scores evolve, and Tyler and Joe make decisions about how to change the blend based on things we smell and taste. But just as with moving barrels around in the cellar or bins of fruit on the crush pad, if you take a few barrels out of a blend and add a few barrels into it – to give it more complexity, weight, depth, or acid or to improve its aromas or its finish – other things change. Change the blend again. Try different proportions. 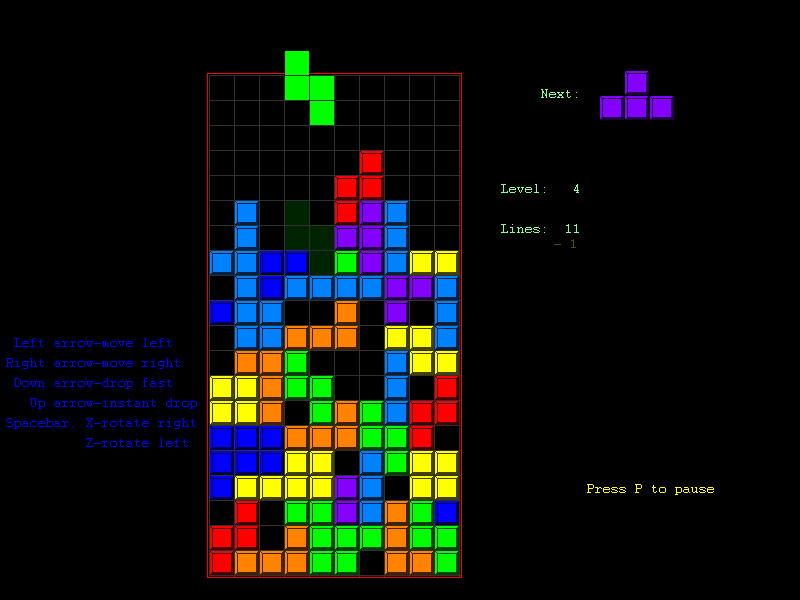 Adjust the other blends, which in turn have been affected by the Tetris. We reflect on taste, smell, and mouthfeel but also math – the math of volumes and ratios as much as that of sales and marketing, all in the pursuit of answering one question: what will make the best wine? And perhaps a further question is always on our minds and up for discussion – what makes a wine great? From the barrel room and warehouse and cellar to the blends themselves, we have a finite amount of wine and space and a seemingly infinite number of ways to put them together. And with infinite possibilities come infinite considerations. 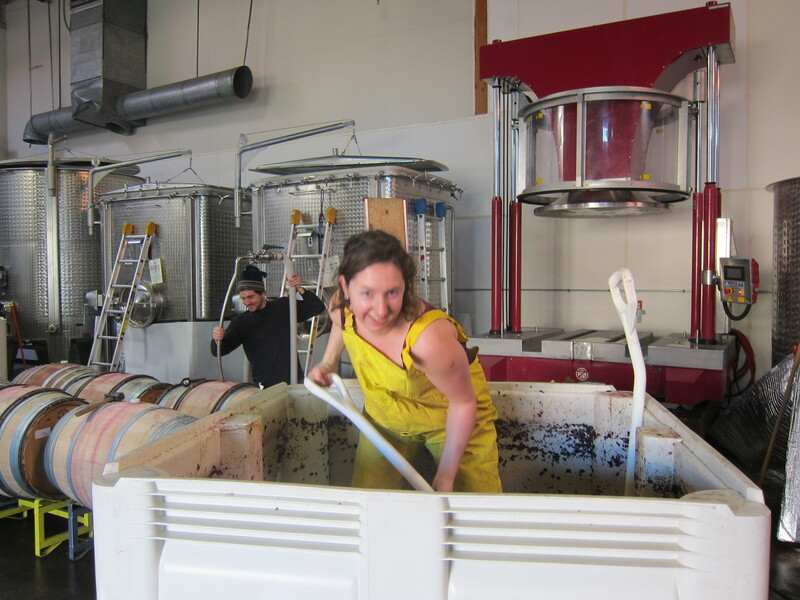 Winemaking is a living process. Vines are alive. Fermentations are alive. Their components are not stable, their yields are evolving, and the winemaking they nourish must be fluid to encourage their interaction. Perhaps unsurprisingly, every part of the industry reinforces that we are bound to the growing – not least of which is the continuously shifting scenery of the landscape. The vineyards have entered a curiously beautiful middle stage – still spare and bare but visibly nourished and livened by rainstorms, more light, and what can only be described as the earliest onset of springlike symptoms. 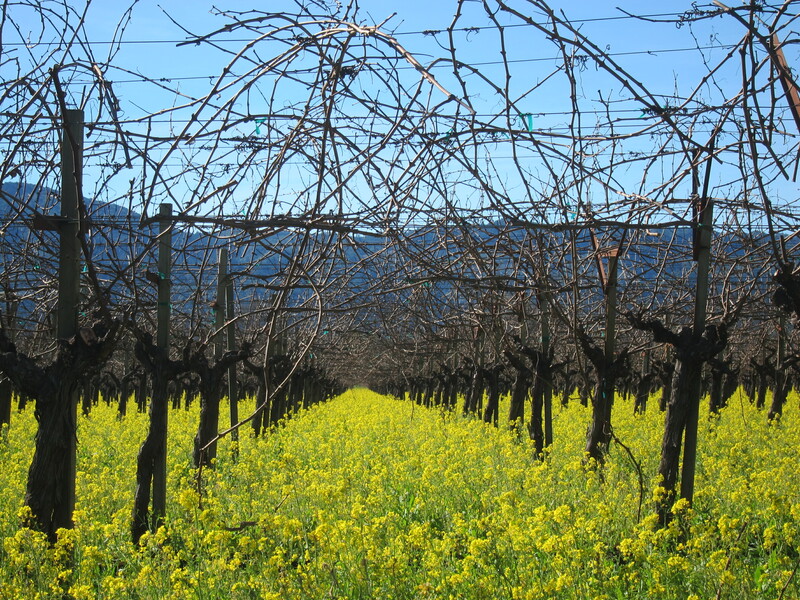 The bright green new growth of cover crop has carpeted the vineyards, many of which are also overrun by flowering weeds. Winter is the green season in California, where spring comes sooner than in my last home. The magnolia blossoms – which were striking and luscious against a backdrop of melting snow in soggy New England Marches – are already out here, along with camellias. In the vineyards, there’s nothing to do but prune the endless rows and wait for bud break, when the industry will get its first inkling of the growing season’s schedule. As ever, it’s a grape’s world and we’re just living in it.